Life. Beauty. DIY. Home. Photography. A while back the lovely Varinder tagged me in her Tag, What's on my Bed Side Table. 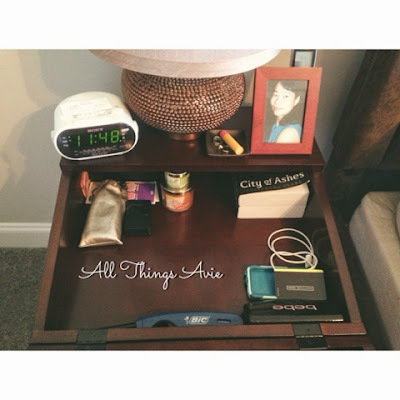 It's basically a tag sharing what you have on your night stand or bed side table. She started this tag and I was lucky enough to get tagged. 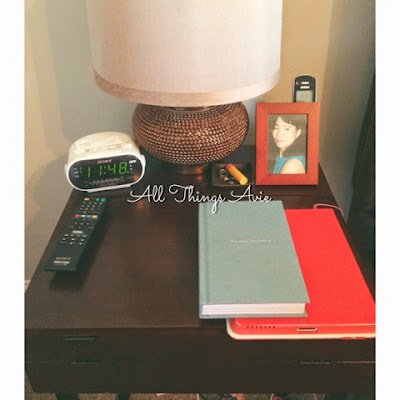 Now I am FINALLY sharing what I have on my nightstand. (Sorry Varinder, it took me way too long to post this!) If you haven't already, visit the lovely Varinder's blog, by clicking here! You will not regret it! Thanks again darling for tagging me! My night stand isn't normal at all. haha =P It actually opens up, so I can store things inside also. You can barely see the hinges in the pic. Anyway, on to what I have on top of my night stand. I try to keep only the items I use on a daily basis on top and the items I don't usually grab all the time, but like to have just in case. That pretty much sums up everything I have on my night stand. Nothing fancy and it doesn't change much from that. Other then I usually have water bottle full of water. I like to drink water before I go to sleep and right after I wake up. Sometimes I end up drinking water through out the night also. Sorry if you have already been tagged. & if you anyone else wants to join in on the tag, please do! Be sure to leave a comment with your post as well. No Problem hun. Can't wait to see your post! No Prob! :) Can't wait to see your post!